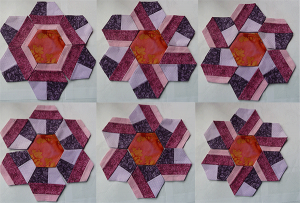 When I came across Mickey Depre’s Pieced Hexies class on Craftsy, I was excited at the thought of hexie variations, and signed up immediately. So I thought I’d share my thoughts on this class here. Before taking any Craftsy class, I highly recommend you check the comments section first. Curiously, for this class you will see most users give it five stars. And then a handful who only give it one star and express deep disappointment. As far as I can tell, this has to do with the skill level. That is, more experienced quilters give it a lower rating, and several of them express not having learned anything they couldn’t have figured out on their own. Those users also point out this was a really short class, and don’t feel it lives up to the excellent level found in most Craftsy classes. I understand the feeling, and –almost– could say the same for myself. HOWEVER… I didn’t take the time to examine the samples shown in the video demo before I signed up for the class. And, in all fairness, this class is a lot cheaper than the longer classes. So yes, maybe you don’t get all the content you do in the average Craftsy class, but I do feel you get valuable information for what you pay. 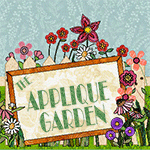 And if you are new to English Paper Piecing, I would definitely recommend this as a great beginner class. The class is broken down into seven lessons. The first lesson is basically a tutorial for traditional English Paper Piecing. 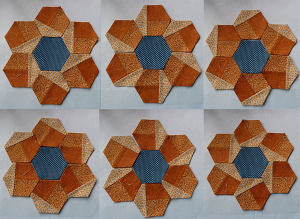 Mickey uses laser cut hexagons from Paper Pieces, which are basted and then whip-stitched – not back-to-back, but lying flat. I personally prefer working with freezer paper and a different way of basting that doesn’t involve having to pick out threads later, but do have to print out and cut my own templates. 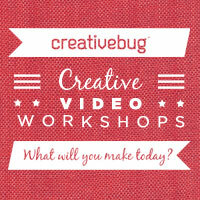 (Video tutorial here.) In the end, you know the saying… “all roads lead to Rome.” So this is a matter of personal preference. What’s important here is that you are given a comprehensive, step-by-step tutorial on English Paper Piecing, which is essential for the following lessons. 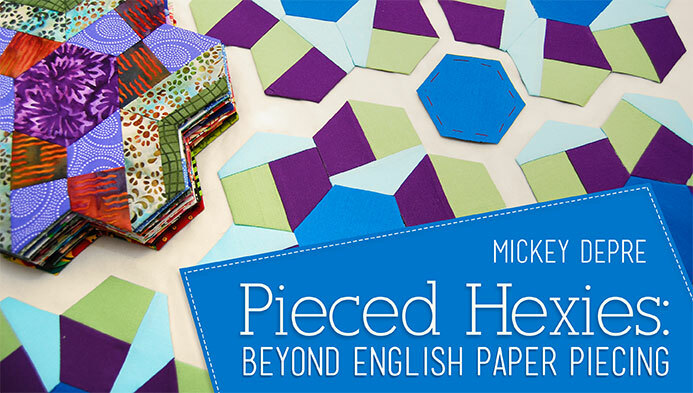 In Lessons Two through Six, Mickey teaches two different pieced hexies and demonstrates how based on only two designs you can create a multitude of variations. 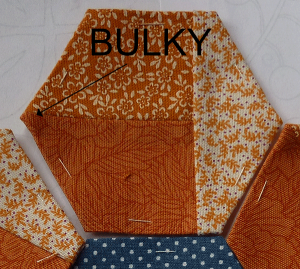 She shows you how to create alignment guides on your templates for precise positioning, and how to cut and sew the fabrics into these pieced hexies. And then it’s playtime, as she walks you through the multiple design layouts for each pieced hexagon, as well as for different combinations. The possibilities are endless. 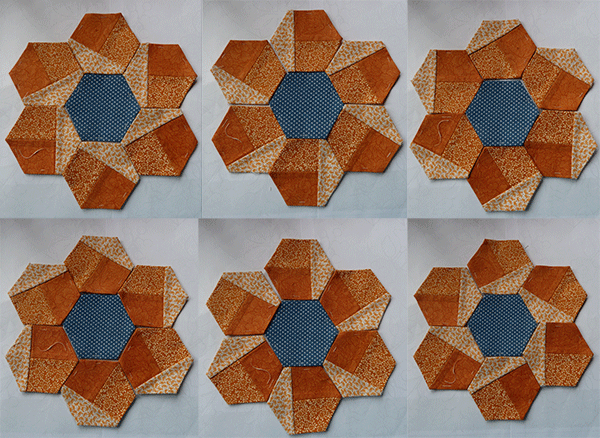 Here are the two hexagon designs I sewed, with six possible layouts in each case. Believe me, there are more! Last, but not least, Lesson 7 gives some valuable insights on fabric selection, including tips on how to select and work with “difficult” fabrics, like stripes and plaids. One of the complaints I would probably have to agree with has to do with the wonderful quilt you will see hanging in the background throughout the entire class. It does seem somewhat misleading, because it gives you the idea that pattern will be covered in the class. It is not. Mickey refers to it very briefly when she introduces the concept of pieced hexies, and that is how I know this quilt is named Whist Jubilance. However, not even she tells you anything about a pattern for it. After some research I found a couple of images of the full quilt, but have not been able to find a pattern it, so assume it does not exist. 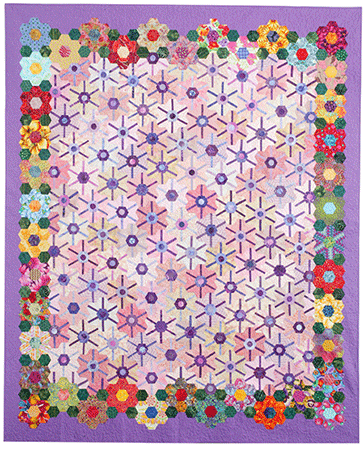 If you subscribe to the Quilter’s Newsletter Magazine, you will find the pattern for the pieced hexagon rosettes shown in this quilt in the October/November 2012 issue. 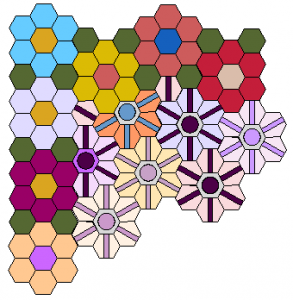 The border hexagons are traditional rosettes. You can also see a larger photo of the quilt here. 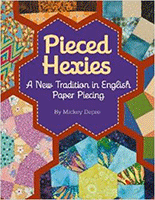 And if you don’t receive that magazine, I found out the pieced hexagon rosettes pattern is included in her book Pieced Hexies: A New Tradition in English Paper Piecing . 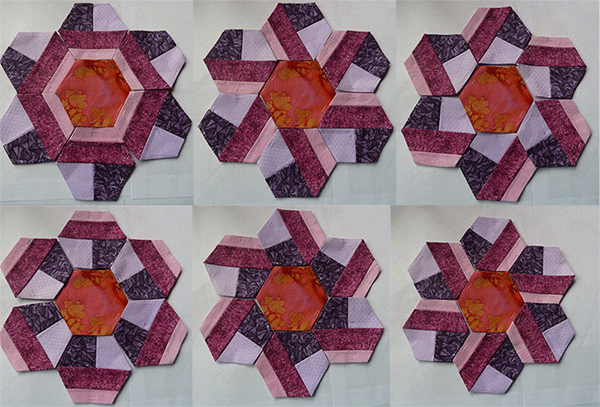 The book includes seven different pieced hexie designs and instructions. But note it does not provide any instructions for quilts. As with the class, I’m quite ok with that. In the end, I’m interested in learning new techniques and in building skills, and prefer designing my own projects. But I did want to see if it is possible for advanced quilters to do this on their own. And yes, it is possible, if you are willing to take some time to figure it all out. Especially the math. This is something I am likely to do, as I tend to prefer working smaller than most people. For example, Mickey works with 1-inch hexagons, whereas I prefer ¾” and even ½” hexagons. But you can adapt her method quite easily to any size you like. If you work with quilting software, playing with designs is completely doable. Just for fun, I wanted to see if I could reproduce Mickey’s wonderful quilt. As this is just an exercise in design for me, and not a quilt I will be sewing, I only worked on one corner… and below is the result. Personalmente me encanta trabajar con hexagonos pero sinceramente …para mi manera de ver… el trabajar con diseños , diagonales etc…se me hace complicado. Pero reconozco que queda un trabajo hermoso. I had a similar experience. Wasn’ even going to take the class because some of the negative comments. But after taking it, I think it was completely worth it. She shows a new method (for me, anyway) of connecting the hexies which looks much easier and clear. ALSO, the materials that come with the class are terrific – shows so many variations. Her original idea has such incredible potential. Finally, I’m so glad that you showed that you can easily analyze the lovely quilt in the class once you’ve taken her class.